The Scarborough inter-angling-clubs Challenge Trophy - The Bell Trophy. The date for the annual match is decided by the previous years winners and must take place between 1st January and 31st March - Rule 7 (below) and the match must not exceed 4 hours. Competing in the event is by invitation only. Scarborough Rock Anglers Society stress that all competitors meet at the meeting point Oasis Cafe, North Marine Drive, Scarborough. The competition is open to ALL the members of an individual club and not for a select few, as has been done in the past by certain clubs. Boundaries are listed in the Rules below (Rule 2). A Clubs 'aggregate weight' is determined by dividing the total weight of fish caught by the number of anglers in each Team. The ideal Team is of eight anglers, any less and the Team must still pay for a Team of eight to enter and the aggregate is still worked out on a Team of eight. All entrants pay the £3.00 fee (2013) made up of £2.00 Team - Sweeps £0.50 aggregate weight - £0.50 Heaviest Single Fish. A Team can have more than eight anglers but the total weight is then divided by that number in the Team. Any club with around 14 to 16 anglers (or more) would benefit from entering two Teams, rather than one large Team. Catches are weighed to the nearest dram, being 16 drams to an ounce. Team aggregates are also calculated to the nearest dram, hence the results can take a while to work out. Clubs often run their own individual sweeps and these prizes can be awarded by the organizers during the presentation. The weigh in takes place at the Scarborough Rock Anglers Society social club from 2pm to 3pm. A buffet is laid on by the organizers and there is always a raffle. 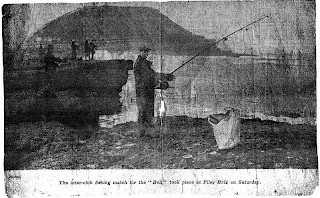 The following photos and newspaper clippings have been kindly supplied by George Dunn, Secretary of Scarborough Rock Anglers Society. The caption reads "Owing to stormy weather not a single bite was recorded when East Yorkshire sea anglers competed on Filey Brigg on Saturday for the bell Trophy. Here are three of the fishermen, Messrs. Pritchard, Peel and Vasey, of the Scarborough teams. The trophy is a bell which was used in Turkey during the war to sound the alarm during gas attacks. The competition will be held again when conditions are more favourable." Unfortunately there is no date of publication. 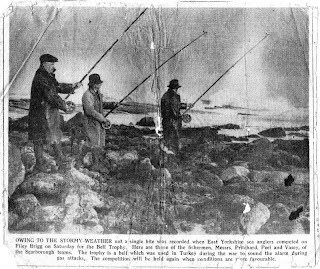 The caption reads "The inter-club fishing match for the "Bell" took place at Filey Brigg on Saturday." Once again no date of publication. Scarborough Evening News February 2nd 1963. The above is from the Scarborough Evening News February 2nd 1963. 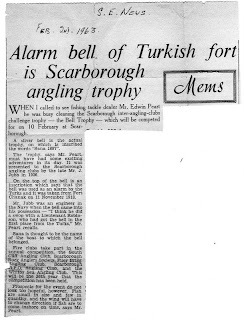 Alarm bell of Turkish fort is Scarborough angling trophy. When I called to see fishing tackle dealer Mr. Edwin Peart he was busy cleaning the Scarborough inter-angling-clubs challenge trophy---the Bell Trophy---which will be competed for on 10 February at Scarborough. 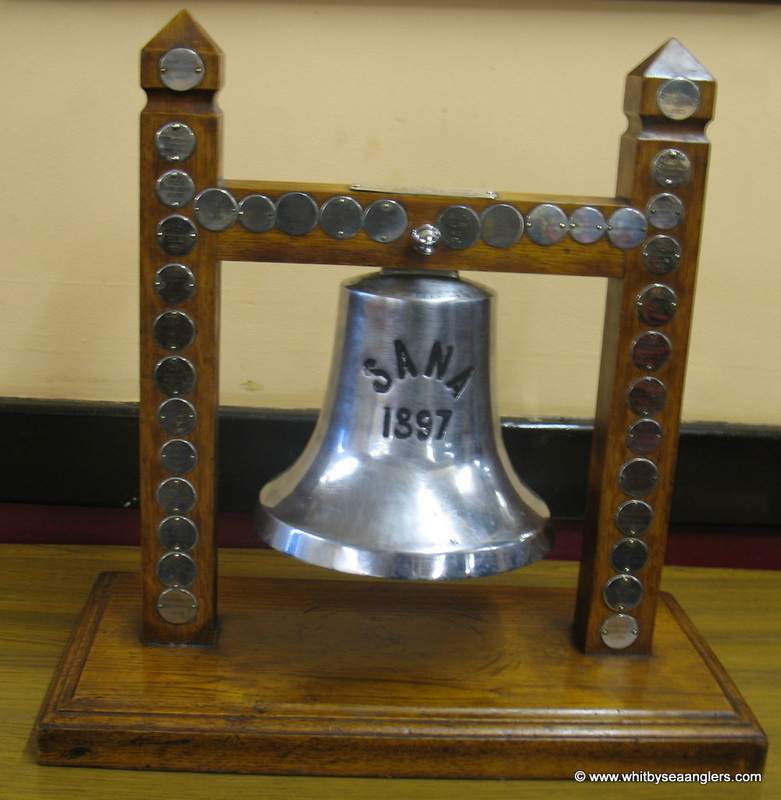 A silver bell is the actual trophy, on which is inscribed the words “Sana 1897”. The trophy , says Mr. Peart, must have had some exciting adventures in its day. 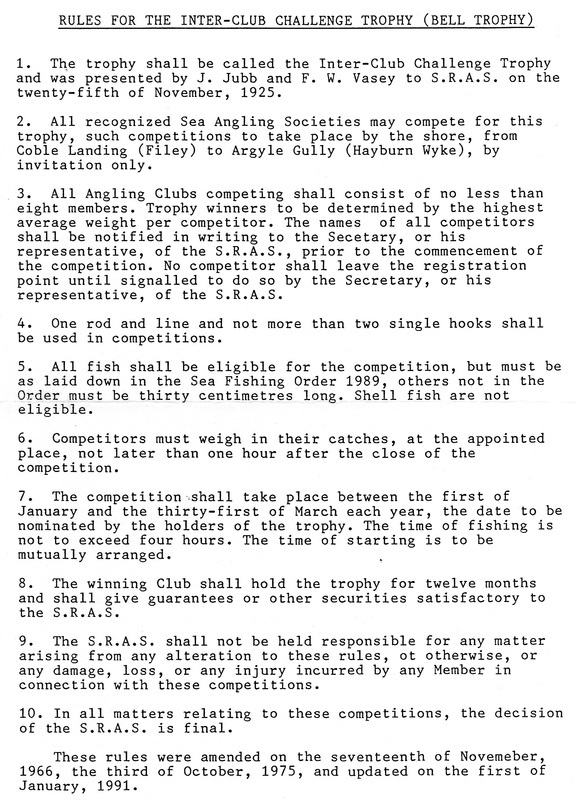 It was presented to the Scarborough angling clubs by the late Mr. J Jubb in 1926. On the top of the bell is an inscription which says that the bell was used as an alarm by the Turks and it was taken from Fort Chanak on 11 November 1918. Mr. Jubb was an engineer in the navy when the bell came in to his possession – “I think he did a swap with a Lieutenant Robinson, who had got the bell in the first place from the Turks,” Mr. Peart tell recalls. 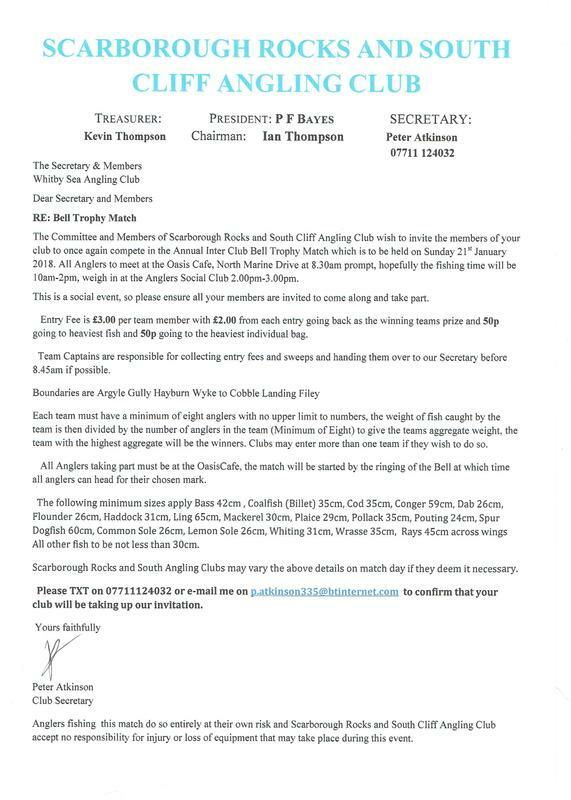 Five clubs take part in the annual competition, the South Cliff Angling Club, Scarborough Rock Anglers Society, Filey Brigg Angling Club, Scarborough G.P.O. Angling Club and the Whitby Sea Angling Club. This will be the 36th year that the competition has been held. Prospects for the event do not look too hopeful, however. Fish are small in size and few in quantity, and the wind will have to change direction if fish are to come inshore on time, says Mr. Peart. The report says, 1963 was the 36th year of competition then the next in Jan / Feb 2013 will be the 86th*. *However this does not tally with the engravings, more research is required. The Bell Trophy. Photograph by Bernard Vasey. Çanakkale (chänäk`kälĕ) or Chanakkale (–kälā), city / capital of Çanakkale province, in north west Turkey, on the Asian shore of the Dardanelles. The city has long been fortified and has a 15th-century fort. In World War I the city and fort were bombarded (1915) during the Gallipoli campaign. The paddle minesweeper HMS Kinross survived the First World War but was mined and sunk in the Aegean Sea on June 16th, 1919. 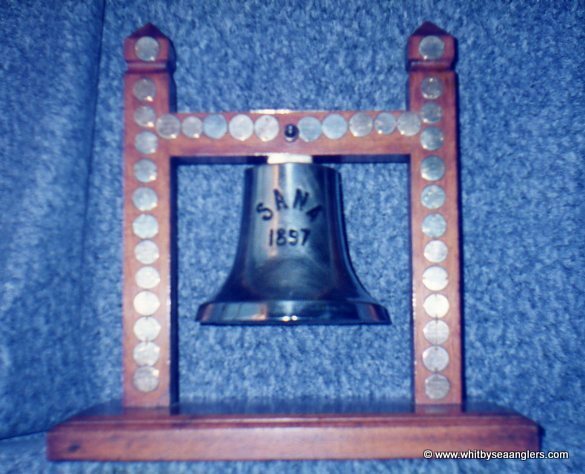 'Sana 1897' in an internet search does not throw anymore light on the bells history. There is a discrepancy with the report above, which says the 1963 Bell Trophy Tournament was the 36th. 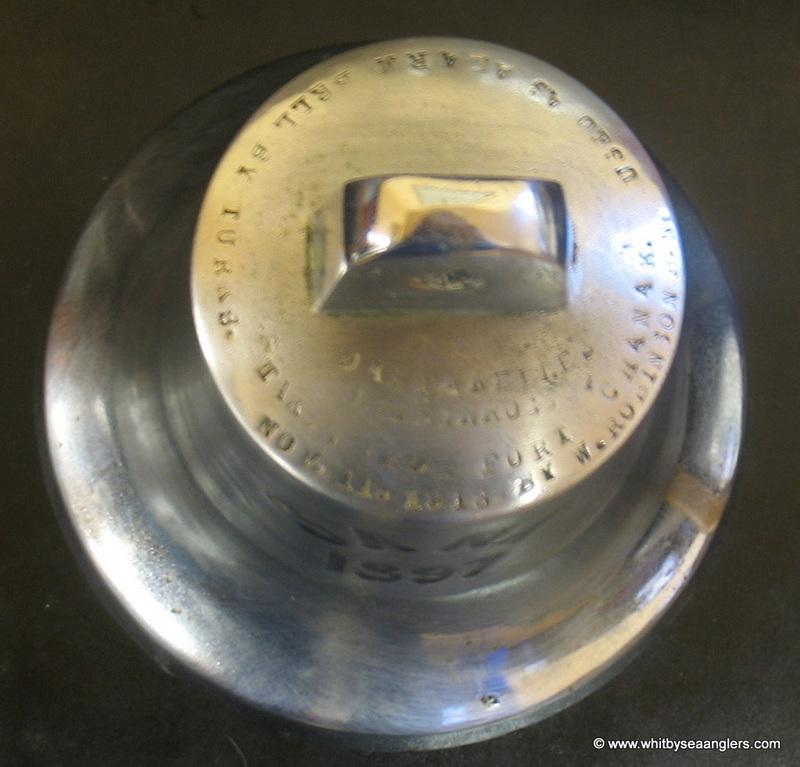 Yet, on the Bell's mount there is an engraved shield for 1926, that would have made 1963 the 38th Bell Trophy, two years out. There are a few engraved shields missing 1941 to 1946 is believed to be the war years and maybe the Bell Trophy Tournament did not takes place. The other gaps in the history are being checked up on as Scarborough Rock Anglers were not aware there were shields missing. As soon as George Dunn gets back to me with the missing clubs names I will fill in the spaces - updated & completed 20th March 2014. *By 2017 all engravings and plates are up to date. *Found in WSAA archives - not engraved on Bell - Bell now up to date.